Marvelous Multiagers! 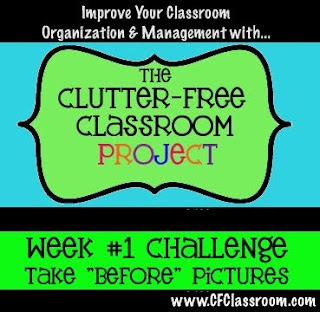 : Clutter-Free Classroom Project: Week One! As soon as Jodi posted about the Clutter-Free Classroom Project, I knew I had to participate. I am not super organized. I want to be, but it's just not a part of my personality (which I think makes me a minority in the teacher blogging world). Does the mess in my classroom bother me? Yes, but not overly. The Week #1 Challenge is to post our before pictures. Just like everyone else, this is pretty embarrassing. But I have been comforted by everyone else's posts!! It's not just me!! This is my coatroom. It is amazing that I have a coatroom, but it is an absolute disaster in here. All of the boxes on these shelves are FULL of books that were already in my classroom that I don't want in the classroom library for whatever reason. It also houses any extra stuff that I don't know where to put because during the day I can't see it! Here is another corner of the coatroom. There used to be a massive aquarium tank in here but I removed it a few weeks ago because I kept banging my head on the corner and it was super painful!!!! Look! Something in the coatroom is clean! This is a giant metal cabinet that my cousins cleaned out. This shelving area is okay. It holds all of the textbooks that we regularly use and one section has reference books. It also holds our caddies and scissors/glue basket. But it holds random stuff also. Not cool. In the top right corner is a giant pile of play scripts because apparently I expressed interest in directing a play for the school????? Ay yi yi. And this is the terrible other side of the shelving area!!!! I don't even look at this because it stresses me out. Here is my math stations area. One of my bins became a chair and it promptly broke because I bought them at Dollar Tree. This is also supposed to be my prayer corner. The top shelf of this cabinet has general math stuff in it, like geoboards and hundreds charts. Basically just another spot to shove things where I can't see them! This is my sad desk. I bought that turquoise file box because I think it will help me stay more organized. This is just a catch-all for stuff. The little filing cabinet in front of the desk would be awesome to have so close except I pretty much just use it as a catch-all table!! What is that Scholastic box even doing there?? And right now our recycling bin is ridiculously overflowing because I recycled TONS of stuff. I hope the 6th grade recycling helpers don't kill me on Monday when they come to pick up my bin......... yikes. Last bad picture - this is my small group table that I use during math stations. It would be okay except for that corner by the file cabinet. No one walks over there so I just shove things in that corner! But I don't want to!! Here is my front wall! My whiteboard, clip chart, desk, and lunch choice board are all here. And here is the back wall. That cabinet with the textbooks and then random stuff is in the middle. You can also see my computer table and the small group table. Here is one side wall. This is where we sit for whole group lessons. You can also see the calendar board, our student work boards, and then another display of student work that needs to be taken down since it isn't Christmas time anymore! And the other side wall. Here is our word wall and our art display section. Also you can see the two entrances/exits to get into or out of the coat room! So that's the scoop!! Thanks for sitting through all those pictures. :) I am looking forward to being organized someday!! I also have tissue paper pom-poms and crate seats in my classroom! :) This will be a fun adventure! I was going to say what Jodi said, as far as you having a lot of shelf space to work with.. you will have this room in tip top shape by the end of the project - good luck!! Just found your blog! Can't wait to poke around...I love your crate seats. How do you like them? I love your ceiling decorations! You should make a little New Year's resolution face thing for the hallway saying that you want to be more organized!! Don't you just wish that things always stayed organized?!? :) Good luck! And to Kate - I like the crate seats and my kids like them too, although we had to have a discussion about how to use them. As in... you sit on them, you do not take the tops off and use them as cushions for the chairs at your desk. Also you do not stand on them. Ay yi yi. I can't wait to see your progress-I just know you are going to get so organized we will all be jealous! I understand what you are going through with your coat room- I have a closet at the back of my room that EVERYTHING gets tossed into-one day I could hardly get the closet door open there was so much junk in it!